You know how it is when there's something you SHOULD be sewing but you can't stop thinking about what you WANT to be sewing? (Well, the very sensible Mary Nanna and The Selfish Seamstress probably don't, but some of us get sucked into sewing stuff we HAVE to do over stuff we WANT to do). Anyway, I realised a while ago that sometimes the best course of action is turn my back on the should-do and get the want-to out of my system. Since I'm procrastinating on the should-do anyway, at least my time is enjoyably productive! So I ditched plans to work on my sleeping bag design and worked on this instead. It's cut in one piece, so very simple to construct, and the style really lends itself to the types of embellishment I love doing. I'm sure I've seen this design going back to at least the 40s, but I'm certain it's well older than that! The one I've made has been modified and tweaked in various places from the original to give more coverage at the back and hopefully a more secure fit, and to fit my idea of how it should look. It retains the soul of the original, but has become very much my take on it. It's supposed to be worn over other clothes, but no little girl wants her dress hanging loose and getting in her way while she's playing. Or back to the sleeping bag. It's potentially a good seller, and I want them for the twins for winter (they wriggle out of their covers and keeping his legs encased helps prevent Nicholas from climbing out of his cot!). But inspiration is sulking in a corner with arms folded and lips tightly clamped together, so instead I'm dreaming of the next project. I have visions of a baby-style trench coat. I've been thinking that just for fun I'd like to document the drafting process and construction rather than just present a photo of the finished garment. Anyone interested? 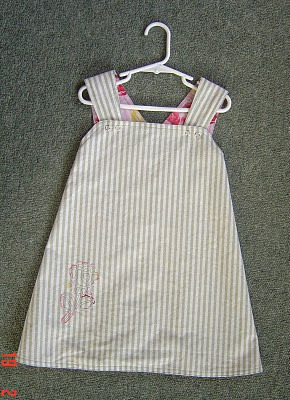 what a gorgeous play dress - from your comments I'm guessing that it was some kind of over-apron style dress? oh yes please show us your technical know how - a baby trench, totally intrigued. 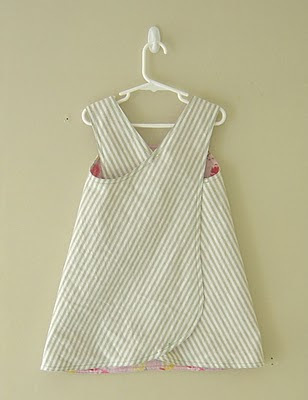 That is another adorable little dress. Nice sewing! very cute. I've seen a bunch of versions of this one-piece apron thingy, but this is by far the most stylish I think. love it! Yes please! It is wonderful to watch someone else--especially someone so talented!--work her way through things. Gotta love the creative process! And we're back to baby sewing! Hey, it's ME on my own blog!